We stock material in the three most popular colors: green, beige, and red. Many other colors are available as special orders. Here is a high-resolution image with color names. The standard names shown on the chart are Turf Green, Weather Wood, and Cherry Wood. Benches in these colors usually have near-immediate availability. Please call (727) 442-5319 for current stock information. The other 17 colors are available on a special order basis and generally require approximately 6 weeks for obtaining material and crafting the components. 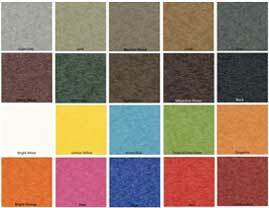 The minimum order quantity is 15 benches for non-standard colors due to material lot sizes. Graphics and text are CNC milled into the face of the signboard, revealing an underlying contrast color and creating a relief texture. 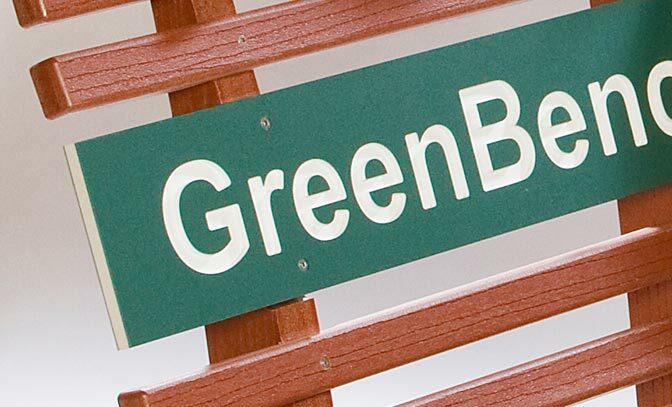 The signboard is created as a single piece of plastic to ensure it is strong and suffers no delamination issues. Alternatively, the design can simply be milled into a solid-color panel, yielding a more subtle appearance while still being indelible. Cost of custom signage depends on complexity of the design. A typical price is approximately $50 per bench. There is no one-time setup fee. Some of the possible combinations are shown below. Other combinations may be available as special order.